Steven D. Rick is an attorney and partner of the firm. Mr. Rick received his Bachelor of Science from Bethany College, Santa Cruz, California, in 1978 and his J.D. from University of the Pacific, McGeorge School of Law, Sacramento, California, in 1986. Before moving to Michigan in 1995, Mr. Rick practiced law in Bakersfield, California, for eight years. 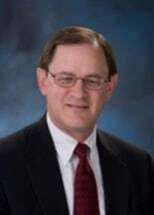 He is a member of the State Bars of California and Michigan, the Jackson County Bar Association, and the Probate and Estate Planning Section of the Michigan State Bar. He is a member and past president of the Jackson Area Estate Planning Council. Mr. Rick's practice is primarily focused in the following areas of the law: Probate, Estate and Charitable Planning; Trust Administration; Probate and Trust litigation; Real Estate; Non-profit Organizations. Mr. Rick is an active member of the Jackson County Community, currently serving on the Boards of Henry Ford Allegiance Health, Concord Educational Foundation, and GuideStream Charitable Gift Fund. He is a former board member of Concord Community Schools, the Jackson Chapter of American Red Cross, and his local church. He is happily married and the father of three children.